Thousands of customers, like Annie, depend on Metro transit every day to get to work, to school and other important destinations. We hope you enjoy her story and we’re interested in your transit story too. 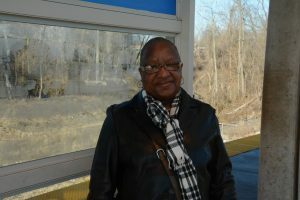 Email mrhibbard@metrostlouis.org and we may share your story in a future “Passenger Profile” blog. Annie has been riding MetroLink for seven years and says it’s the most convenient way to travel around the bi-state region. Before her retirement, Annie would ride MetroLink from the Fairview Heights MetroLink Station to the Central West End MetroLink Station and walk a few blocks to St. Louis Children’s Hospital, where she worked. Today, she still makes that same commute, only now she heads to the Central West End Station so she can go to Barnes Jewish Hospital to manage her health. She enjoys meeting people on the train and striking up conversations. When she isn’t chatting, Annie enjoys reading a book. “You save on gas, wear and tear on your car, and you save time,” Annie said. She also saves money. Annie qualifies for the reduced fare program, which provides Illinois residents in Madison and St. Clair Counties reduced or free passes. Annie uses MetroLink primarily to get to and from the hospital, but she also uses it to spend time with her family. Occasionally, she’ll ride the train to Lambert-St. Louis International Airport with her grandchildren. “It’s the best way to go,” she said.